Who wouldn’t LOVE to go for a Coffee and Art Stroll? Now that I know there IS one, I might plan an entire trip around it! That’s one of the many things Holualoa has to offer – looks like the first Saturday of November. 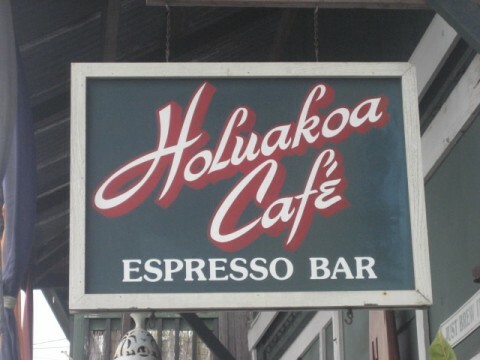 Apparently, each shop in town (which is almost certainly an art gallery of some sort, whether it’s paintings or woodwork or quilt-type things) hosts a coffee from one of the (more than) 30 Kona coffee farms. It is a fun, quirky, cute little town (well, it’s not as “little” as I thought – apparently, according to the 2000 Census, there were over 6100 that lived there) – one of my two (maybe three) favorites on the Island (so far). You can park and walk from end to end of the main street, stopping in at this Gallery or that Gallery, have a break at this coffee shop or that restaurant. 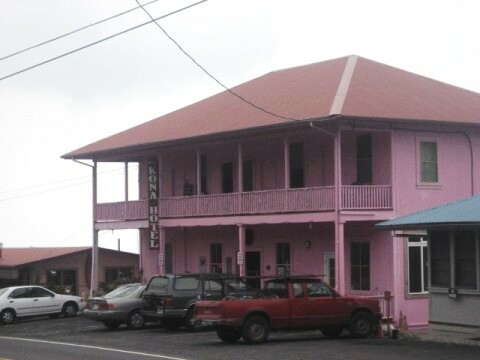 There’s an iconic pink hotel that completely represents the friendly, relaxed atmosphere of the town. We stopped in one time, to take a look around. There was nobody at the front desk. 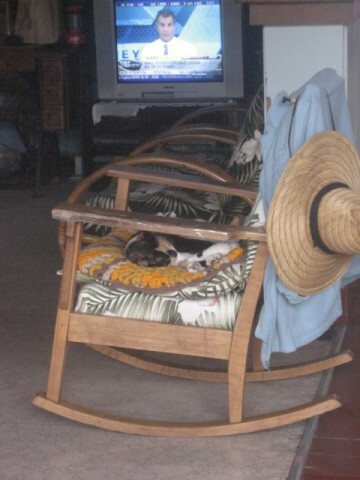 There was someone asleep in the rocking chair, watching the TV in the reception area, and a cat sleeping on the other rocking chair. (Nobody came, and we tiptoed out.) I didn’t take many pictures, but I’ve filed the memory away for safe keeping. It’s better if you make an afternoon of visiting Holualoa – don’t rush through. I didn’t buy a hat (or take pictures), but I have a couple sets of the slippahs. 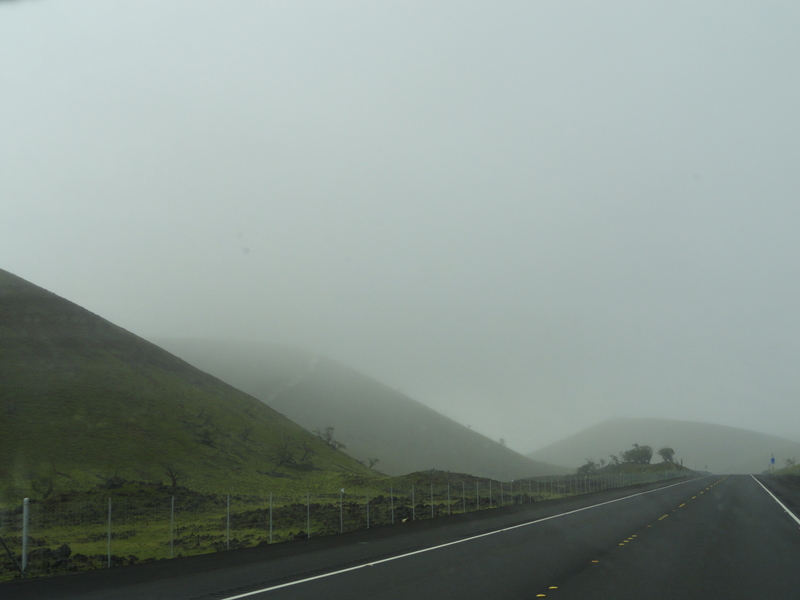 Passing straight on through, and out the other side of Holualoa, you will go down a very scenic drive, with a very winding road through coffee plantations. If you go at the right time of day, you might even be able to stop at a shop or two along the way for samples. 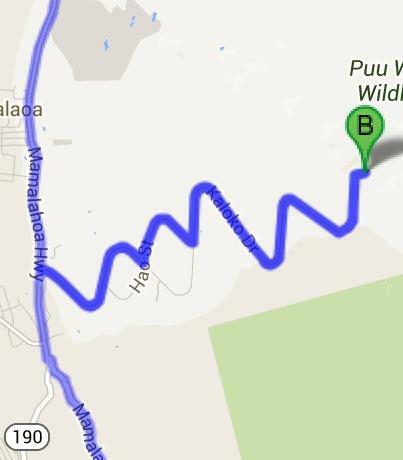 Eventually, you come to an intersection where you can go down the hill to Kailua-Kona, or up the hill towards Waimea. Be sure to take a look at the Painted (well, Rainbow) Eucalyptus trees there, before you proceed. 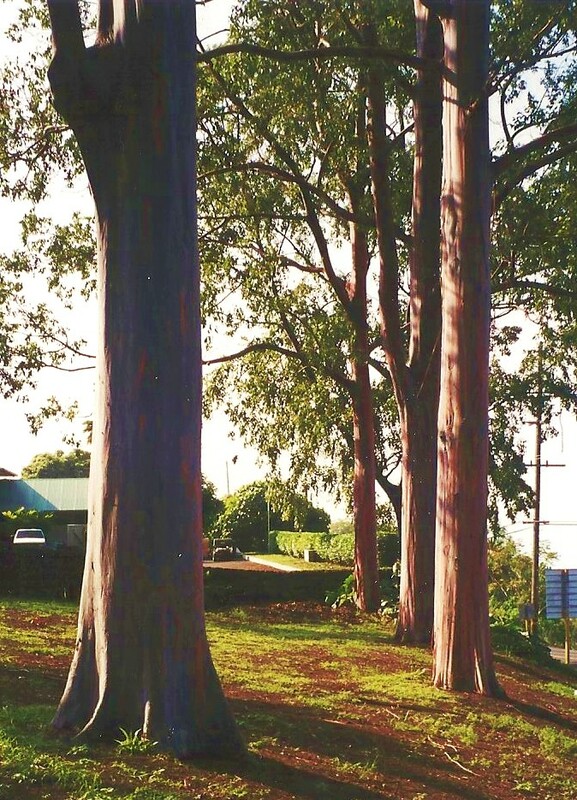 My picture isn’t great (but it does show the particular Eucalyptus Grove…I’m including another picture I took in a different place on the Island, just so you can see how pretty they are!!) 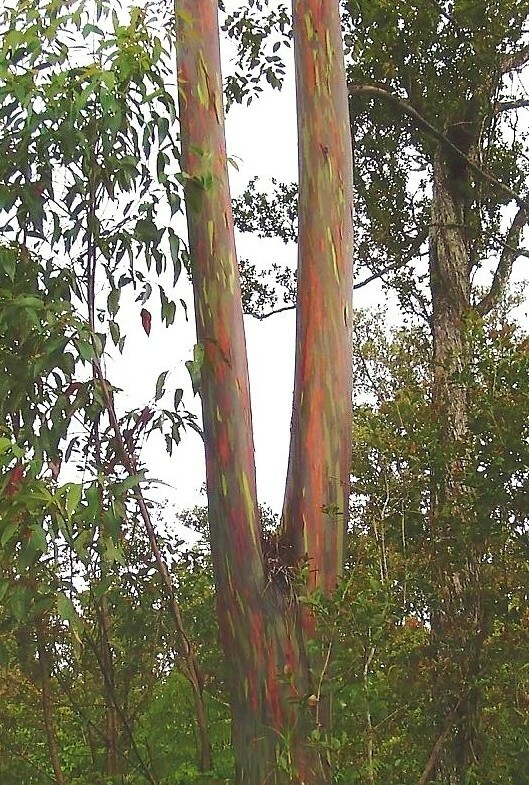 Apparently, they are the only Eucalyptus to grow in the Northern Hemisphere AND the most colorful trees in the world! 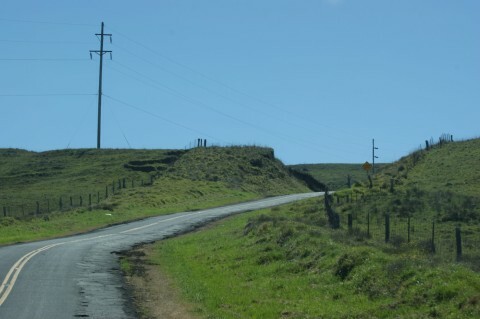 We are going up the hill towards Waimea. Just about a mile up the hill is the turn off, onto Kaloko Drive, to go to Cloud 9. 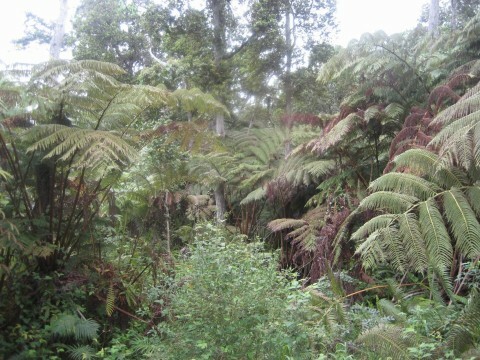 I don’t know exactly where, but you can get out and walk around in the Tropical Gardens of the Kona Cloud Forest. It’s a beautiful walk with moss-covered trees, and native tropical plants. Unlike a Rain Forest, which receives it’s precipitation from Rain, the Cloud forest receives 40% of it’s precipitation from – guess where! yep! Clouds & Mist! Continuing up the winding and fairly steep Kaloko Dr. (and perhaps Hao Street, says Google-maps), you will start passing addresses: Cloud #7, Cloud #8 – Cloud #9 (the ideal address), and on up! I forget how many “Cloud s” there are, but it seems to me that we got to at least Cloud #14. 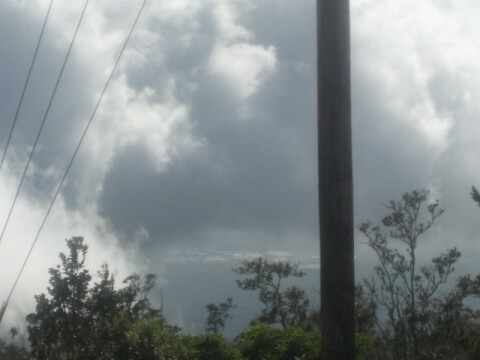 This grey cloudy picture is a view from the top of the Cloud Forest road, looking back down to the shoreline. I guess seeing the shoreline is rare since normally, it’s completely clouded in! 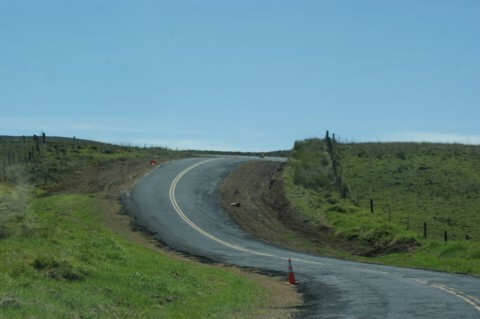 Down at the bottom the hill, and continuing uphill toward Waimea, you will probably be surprised by the scenery. It’s rolling hills and tall waving grass, and cattle ranches, and pear cactus! 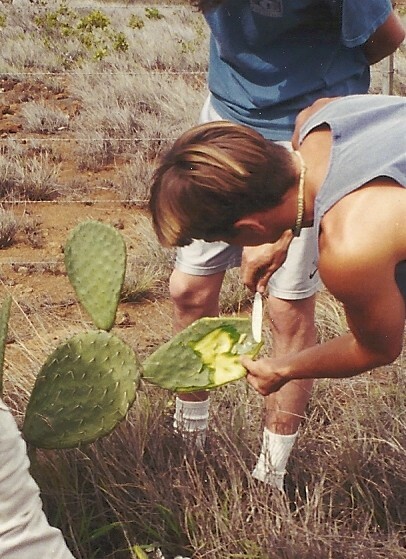 Yes, in Hawaii – cactus. There’s also Hawaii-typical scenery, too – The Ocean, for example, and Cinder Cones. After driving about 30 miles (from the Cloud Forest road), you will get to Saddle Road. Once upon a time, rental cars were not allowed to take it – the road used to be TERRIBLE and the Pass is high altitude, and not very busy, so if you ever had any car trouble, you’d be stuck. NOW, the road is GREAT! And well travelled! It saves about an hour of travel time (at least) from the old route. Up at the top of Saddle Road (well, it feels like the top – I think it’s actually sort of on the way down the other side), it’s completely barren. It looks like the lava just came through – almost nothing has grown back (probably the high altitude?) and is usally misty and eerie. Then, suddenly, you emerge, and sometime after that (I always think it’s going to be 10 or 15 minutes, and then it feels like hours), you see the sparkling lights of Hilo, coming through the trees. 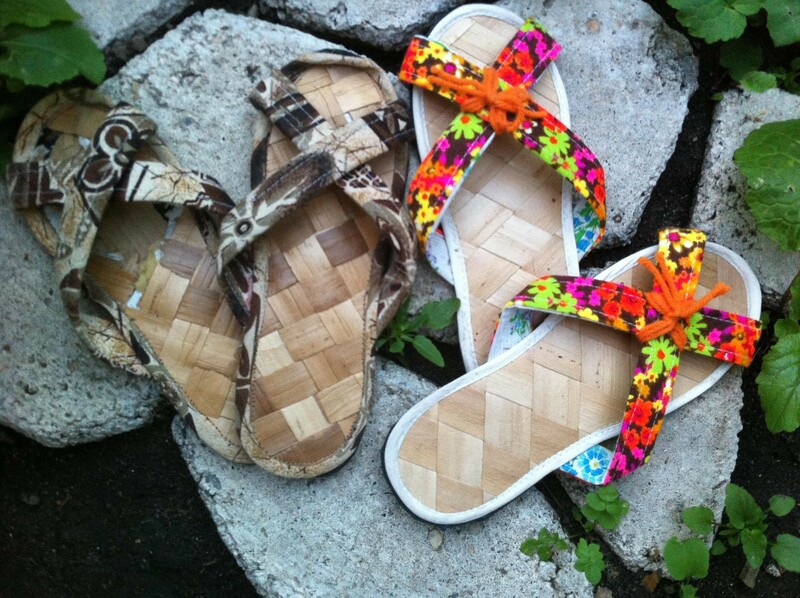 Love the slippah’s. but wonder if they are still cute in a size 8.5. ???? One way to find out! Let’s go there next time we’re there together!